What do you do when you have a passion for rare old cars and one irreplaceable part breaks? If you are a stand-up comedian who looks like a T-Mobile Android G1, you scan it and print a new one. 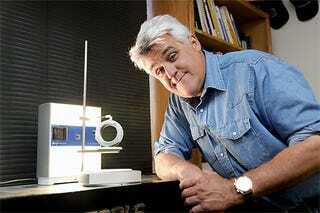 That's exactly what Jay Leno does: He scans the part in a NextEngine 3D Scanner in about 20 minutes at a 160,000 dots per inch resolution. Then he prints the resulting 3D model in plastic using a Dimension 3D Printer. It takes three hours to get the plastic model, which then he uses it to create a mold that will produce the actual car piece in metal.